It is not always in the dynamic miracles that God is best encountered. Sometimes He is more effective speaking quietly. My own experience hearing from God has been Him speaking audibly and clearly to me. I heard from the Lord a positive response about my request to Him for me to see the risen Lord Jesus Christ as I mentioned in the previous page “Have you seen the risen Lord Jesus Christ?”. 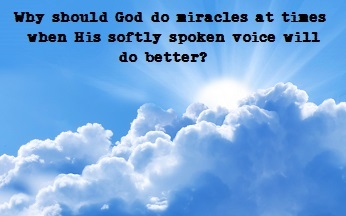 However, God also told me that He would be speaking to me but very quietly. Formerly, being an atheist was not something I commonly talked about. I spoke to only a small handful of people about this. Not every former atheist becoming Christian is shy about it but I was. When I used to be an atheist I was the kind that did not want to talk about religion so I kept this a secret to myself and an atheist friend with whom we never spoke about it. When I got flipped upside down in an auto accident and started searching if there was a God, my becoming an agnostic was news enough so my previously being an atheist did not come up. When I became a born-again Christian, believing in Jesus, I wanted to put my old manner of life far behind me. Now suddenly, God tells me He wants me to tell people. So, I did and, consequently, it indeed enhanced my sharing of the gospel. Then shortly later, God spoke to me again about this while I was speaking to Him about it. He said, “Now I want you to put up a webpage about it.” So, I started writing this up. Then God tells me soon after, “While you’re at it, I want you to write up a tract about it.” I said aloud later, “What am I going to title this? ‘I was a teenage atheist’?” I soon came up with a title using the question of what I used to ask people while I was searching: “How do you know what you believe is true?”. Therefore, we see also that it is not even in the eloquence of prayers, nor even the speaking in other tongues, that make us effective in our prayer lives. It is God who enables us by His Holy Spirit. 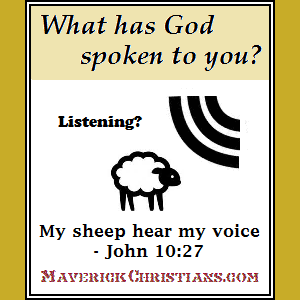 Should you be interested to learn about hearing from God, read more in the article My Sheep hear My voice.